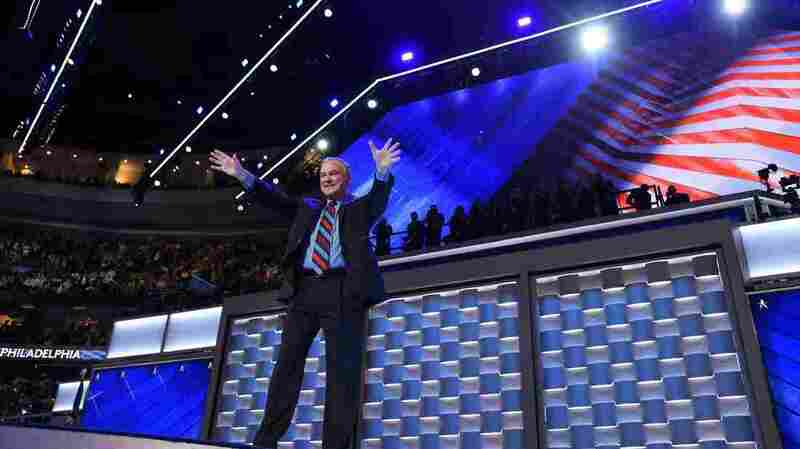 Democratic presidential candidate Tim Kaine salutes the crowd after his address at the Democratic National Convention Wednesday night. Democratic vice presidential nominee Sen. Tim Kaine introduced himself to America Wednesday night as a fighter, Hillary Clinton’s ally and — a dad. Not just a dad to his own children but everybody’s dad. To start, he doesn’t speak like a politician. “Can I be honest with you about something?” Kaine said, “Can I be honest with you about something? I never expected to be here.” He talked about his midwestern upbringing, and his own union father dad. And his speech was peppered with moments that any dad — or anyone with a dad can relate to. The could-be awkward moments that supporters actually found endearing. He mocked Donald Trump during his speech, even though his impressions was not very good. He did a call-and-response with the audience. Threw in some Spanish, though he’s not a native speaker. And then there were the dad jokes.